Shown on the right is a 4 foot cherry of the rio grande tree in April. It is located on the north side of a 6 foot block wall and on the east side of a large pine tree, so it receives afternoon shade. This plant was mail ordered from Florida and planted in full sun its first year. It did flower the first spring but did not set fruit. In June of its first year, the Arizona sun proved to be too much for it and it started to sunburn substantially, so it was transplanted into its current location. It did not flower its second spring and still appeared to be recovering from last summer. In its current location it also sun burned but not as badly as before. This summer, its second, it is currently under shade cloth and I hope it will better be able to handle the summer heat when better established and more fully protected by its own leaves. This cherry of the rio grande was subjected to temperatures of 26 F. in the winter of 2007 and sustained no significant damage. Cherry of the rio grande can be grown in Phoenix but has difficulty with the summer heat, sun, and alkaline soil. It appears to also be sensitive to soil salts, and therefore should not be fertilized. It is evergreen and handles the coldest weather that the Phoenix winter can produce without problems. It grows continuously but slowly during warm weather. The most attractive thing about cherry of the rio grande is that its fruit tastes very much like real cherries. Cherry of the rio grande trees need afternoon shade. During their first couple of years they might even need to be protected with a shade cloth until they are established. Being hardy to 20 F., cherry of the rio grande trees can take the coldest Phoenix weather without protection. Dig a hole at least twice the size of the rootball. At a minimum, make the hole 2 feet in diameter and 2 feet deep. Back fill the whole with the same native soil that was removed mixed with several pounds of sand. Be sure to mix the backfill as thoroughly as possible. It also is a good idea to finish with the hole an inch or two recessed so that a watering basin is formed. After planting, spread a thin layer of compost on top of the soil to help conserve moisture and to supply some nutrients. Cherry of the rio grandes do well on a grass watering schedule during summer, and a citrus watering schedule during winter. Basin irrigation is recommended because it helps keep the salt in our salty water from accumulating around the roots. Furthermore, deep watering will encourage the plant to develop deeper roots, making the plant tougher when the weather gets hot and dry. Cherry of the rio grandes appear to burn very easily in Phoenix soil so any kind of fertilizer should be avoided. 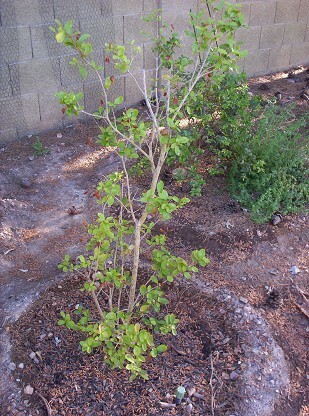 A thin layer of compost around the tree's base is also beneficial. Cherry of the rio grandes are grown from seed. No known pests in Phoenix Arizona.